President Obama inspired a flurry of tweets on Tuesday night. WASHINGTON (CNN) - Members of Congress twittered their way through President Obama's nationally televised speech Tuesday night, providing a first-of-its-kind running commentary that took users of the social networking site inside the packed House chamber. Rep. Jason Chaffetz, a Republican from Utah, began sending tweets from the House chamber nearly two hours before the speech, commenting on the staffers assigned to set up the president's teleprompters. "One tele-prompter appears broken. Still 1.5 hours to go but I bet they are nervous," he wrote from the seventh row of the chamber, where he said he was sitting next to Rep. Jeff Flake of Arizona. As the speech neared, more members of Congress reached for their mobile devices and signed into their Twitter accounts, typing missives to their followers. Texas Republican Michael C. Burgess spent his time examining the president's prepared remarks. "Not much healthcare in tonight's speech it seems," he tweeted while waiting for the President to arrive. Montana Republican Denny Rehberg said the excitement in the room was palpable. "Waiting to hear Barack," he wrote. "Place is on fire." South Carolina's Gresham Barrett tweeted that the "Capitol is buzzing." Rep. John Culberson of Texas, a prolific twitterer and one of the first members of Congress to embrace the technology, not only tweeted from the chamber ("TV lights are so bright I could get a suntan") but also sent live video updates to the site Qik.com as he hustled his way to the Capitol. Though Republicans have proven themselves more eager to tweet than their colleagues on the other side of the aisle, some tech-savvy Democrats were also offering play-by-play as the night unfolded. Rep. Earl Blumenauer, a Democrat from Oregon, sent out a flurry of tweets during the evening. "One doesn't want to sound snarky, but it is nice not to see Cheney up there," he remarked just before the speech. "Obama enters," Blumenauer wrote after the House Sergeant-at-Arms announced the President's entrance. "Crowd goes wild. Members taking pictures. McCain and Lindsey Graham. What a picture." Democrat Claire McCaskill, perhaps the most avid Twitter user in the Senate, was excited to see Supreme Court Justice Ruth Bader Ginsberg appear following her pancreatic cancer operation. "I did big wooohoo for Justice Ginsberg [sic]," McCaskill wrote. "She looks good." Despite the bipartisan merriment in the room before the speech began, there appeared to be some grousing in one Republican congressman's office. "Aggie basketball game is about to start on espn2 for those of you that aren't going to bother watching pelosi smirk for the next hour," read a tweet on Texas Rep. Joe Barton's page, referring to Texas A&M's game against Nebraska. Minutes later, that message disappeared, replaced with the disclaimer: "Disregard that last tweet from a staffer." That note was also deleted after several minutes. And though many twittering Republicans cheered the new President as he entered the chamber, they weren't necessarily fans of Obama's speech. "Hold onto your wallet America," Culberson quipped. Others simply stopped twittering when the speech began, citing manners. "Can't take pics on the floor, and it would be impollite [sic] to livetweet," wrote Jared Polis, the Colorado Democrat. 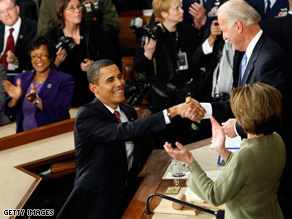 Still, Twitter proved that even members of Congress can be a bit starstruck - and not just by President Obama. "Capt Sully is here - awesome!," tweeted Culberson. This puffed up empty suit is just a distraction. Can we get a REAL leader please? Overall, President Obama did a good speech...but it's action that will tell the whole story. I also through that Jindal gave a sobering, light, speech as well as a follow up. Truth be told, it doesn't matter what party you're in...we are all in this together...either we pick up the ore and row and we let the boat sink. Nice speech. I feel much better now. But wait; I just realized I can't spend a speech at the store. Now I fell worse. But wait – the media tells me the speech is a great occasion and I should feel better. But wait, I am not one of the lemmings from the political parties – I am an independent, and I look for results. Best of luck, Mr. President, I hope your programs work for the good of us all. Please remember, however, the independents need results. I have been proud and supportive of Barack since I became aware of him promoting his book "Audacity of Hope." He never ceases to amaze me. He is wonderful! His speech will help most Americans to have a 'sigh of relief." It is so nice to have a president that is so presidental. Who speak's with knowledge and eloquence. The world can see now that America has a president who has a brain and not bull like the last one. Oh please,CNN. Everyone knows that it is their aides who are twittering not the actual members of Congress. It sounds as if it is partisan politics all over again. I did not watch the whole televised speech, because of all the brava that comes with it. But, what I did watch made me sick. I do not agreee that these electyed officials need to stand up and appluad everytime something was said, but it was an obvious slap in the face to the President to see the Red team just sitting there as if they were in detention. Show a bit of emotion people, the Bush years are over...get over it. I got something they can "TWEET" on!!!! "...Abess demonstrates the kind of "responsibility" the president has called for from high-profile financial CEOs, the White House said..."
I agree with his remark about the banker being generous, however, for it to be a ".... RESPONSIBILITY...?" I think not. The banker could have rightfully kept the money, and has absolutely no responsibility to redistribute his wealth. Yes, he was generous beyond belief, but OBama, we don't want your slippery socialism trying to weasel it's way into OUR country. Shame on you for taking a good deed, and trying to slant it to support your treacherous socialistic agenda. I try not to speak badly of others... Jindal's speech was awful. He walked out looking like a dork. He then sounded like Dr. Seuss with his boring stories. He didn't have a good presence about him, at all. His entire speech was lame. PAY ATTENTION PLEASE, WHAT IS CHANGE? HAVING A PRESIDENT WHO IS MAKING YOU "THINK"
Obama gets more like Hitler every day with his propaganda speeches. I just left a comment. What happened to it. I experienced the same situation yesterday. There is nothing in my comment that is not the truth. And the truth speaks for itself however, many networks don't like the truth. They prefer lies. What an embarrasing GOP response by Gindal.....he looked as uncomfortable as his words were empty and meaningless. Instead of attacking the other party Republicans, how about generating your own solutions. Bunch of whiners!! !